With its virtually universal treaty network and its binding dispute settlement mechanism (DSM), has the World Trade Organization (WTO) become a “legalized” international organization? To a large extent, the positive effect of the move to a higher level of legalization in the WTO is commonly acknowledged. Nevertheless, contrary to the high expectations of trade ‘legalists’, empirical studies suggest that the policy goal of trade liberalization cannot always be achieved by the functioning of the WTO legal system. Indeed, legalization at the international level often affects domestic systems in ways that are not only unintended, but often provoke unanticipated reactions. This incisive new study analyzes the proliferation of legalization in the WTO and two vital aspects of its consequences. 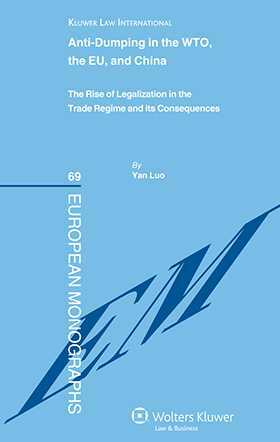 The author illustrates the rise of legalization in the trade regime by examining the pragmatic process of legalization and its consequences in the field of anti-dumping. She particularly sketches the historical development of legalization in the multilateral anti-dumping framework by identifying significant events which illustrate the increased obligation, greater precision, and stronger delegation in the regime. She then explores the impact of international legalization on the EU’s anti-dumping regime and China’s dispute settlement activities in this area since the country’s relatively recent accession. She demonstrates that, even after decades of legalization, domestic anti-dumping investigations often fail to fulfill the expectations of global legalists, and that the results of those investigations are not always challengeable in the DSM. (2) the impact of legalization on the utilization of the DSM to settle disputes in particular subject areas. Concluding that the evolution of the GATT/WTO system is an illustrative example of the phenomenal rise of legalization in international organizations, the book is a valuable contribution to the broader debate of ‘constitutionalization’ in the international economic law literature. This is the first study to systematically analyze the rise of legalization in the WTO and its impact on domestic systems in this context. In its analysis of the discourse, dynamics, and effects of legalization in the trade regime, and in its empirical examples, this book will prove of great value to all professionals, legal or otherwise, involved with international trade and the economics of globalization. Preface. Acknowledgements. Abbreviations. Table of Cases. 1. Introduction. 2. Conceptualizing Legalization in the WTO System. 3 . Rise of Legalization in the Multilateral Anti-Dumping Framework. 4. Legalization of Anti-Dumping Rules at International Level. 5. Consequences of Legalization: WTO-transposed and WTO-plus Features of the European Anti-Dumping Regime. 6. Consequences of Legalization: China’s Anti-Dumping-Related WTO Activities. 7. Conclusion. Bibliography.